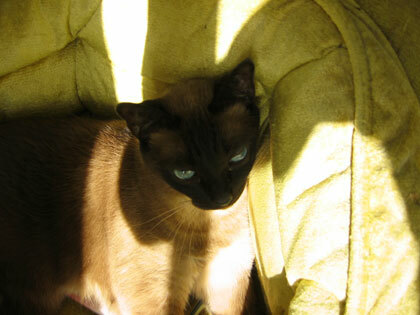 Jasmine, a Seal Point Siamese cat was born approximately on November, 1992. I adopted her during Memorial Day Weekend of 1993. A friend of my older sister's found the frightened cat up a tree. Jasmine did not have any tags identifying her owners. The friend tried unsuccessfully to locate the cat's owners. She (Jasmine) had just been fixed. My older sister's friend could not keep the cat; so, I took her in. Jasmine is a very picky eater, maybe more finicky than Morris the cat. She will eat only the seafood flavors of Fancy Feast gourmet cat food. When I look for one of the seafood flavors that Jasmine will eat, I say to myself, "If Jasmine were not so picky, I would not have this problem." When her bowl of crunchies (Meow Mix) is only half full, she feels that her world is coming to an end. When I eat something, Jasmine will smell the food. As if she would actually eat whatever I am eating! I don't think so. I refer the Jasmine as the Little Princess because of her looks and temperament. I cannot place even a gift wrap bow on her head without worrying that she would scratch and bite me. The Little Princess finds such an act insulting. Unlike the dogs who revel in the treasures they leave in the yard when we pick them up, Jasmine buries her offerings and wants no part of them when I clean out her sandbox. Jasmine loves comfort. She would not sleep in a cat bed if I were to bring one home. Why should she? She sleeps in my bed. If she is not sleeping on any of my pillows, she is hiding under the blankets. When I am in bed, the Little Princess likes to lie on top of me or sit on or near my head. When I watch television, she likes to sit or lie on my lap. Jasmine is talkative. When I call her name, she responds. There have been nights in which I have returned home late, and I can hear her crying. Come and check out Jasmine's photo gallery.